Visualizing Baseball provides a visual exploration of the game of baseball. Graphical displays are used to show how measures of performance, at the team level and the individual level, have changed over the history of baseball. Graphs of career trajectories are helpful for understanding the rise and fall of individual performances of hitters and pitchers over time. One can measure the contribution of plays by the notion of runs expectancy. Graphs of runs expectancy are useful for understanding the importance of the game situation defined by the runners on base and number of outs. Also the runs measure can be used to quantify hitter and pitch counts and the win probabilities can be used to define the exciting plays during a baseball game. Special graphs are used to describe pitch data from the PitchFX system and batted ball data from the Statcast system. One can explore patterns of streaky performance and clutch play by the use of graphs, and special plots are used to predict final season batting averages based on data from the middle of the season. This book was written for several types of readers. Many baseball fans should be interested in the topics of the chapters, especially those who are interested in learning more about the quantitative side of baseball. Many statistical ideas are illustrated and so the graphs and accompanying insights can help in promoting statistical literacy at many levels. From a practitioner’s perspective, the chapters offer many illustrations of the use of a modern graphics system and R scripts are available on an accompanying website to reproduce and potentially improve the graphs in this book. Jim Albert is professor of statistics at Bowling Green State University. He is the author or editor of ten books, including Analyzing Baseball Data with R, Curve Ball, and the Handbook of Statistical Methods and Analyses in Sports. "Jim Albert has a new book out. It’s called Visualizing Baseball and it’s a treat. It is a pretty short book—just 135 pages—and many of those pages are filled with graphs rather than text. Jim is adept at combining words and visuals. His prose is pointed and precise, and he doesn’t waste time 'sabersplaining.' Instead, he articulates a concept and then shows it on a graph. Both parts of your brain are engaged, your understanding deepens, and the lessons carry longer.The graphs start out simple and grow in complexity as the content becomes more complex. Moving from simple scatterplots with fitted lines, Albert moves onto graphs with elaborate labels and changes the size of dots based on some underlying values. He inserts box plots, classic PITCHf/x graphs, density graphs, isobars and violin plots, to name a few techniques. It sounds overwhelming, but each graph builds on a previous one, and it all makes sense as you move along. Most importantly, Albert doesn’t clog his graphs with lots of graph junk and needless color. The only color is blue—everything else is in black/gray scale. So many graphs these days seem to be built to impress other graphic artists instead of educating the reader. This book is a welcome antidote to that trend." "The primary aim of the book is well executed. In almost all cases the graphics are well thought out, and quickly communicate characteristics in the data, that would be difficult to convey using tables or summary statistics. The quality of the diagrams and the printing is very good. Each diagram comes with a clear explanation and many of the results are demonstrated usingwell known players." "This is a book written by a statistician for the stats enthusiast about baseball. I say stats enthusiast and not statistician because little to no stats experience is required to understand the book. 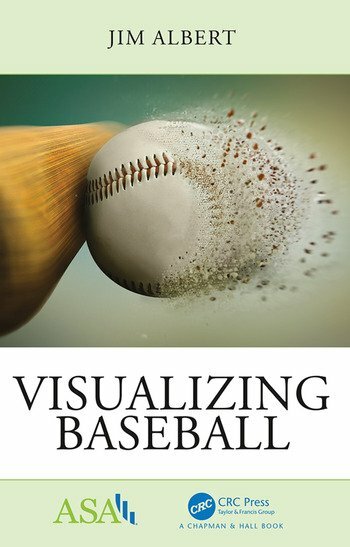 Likewise little expertise about baseball is assumed...The big appeal to Visualizing Baseball is the graphs...I learned a lot from Visualizing Baseball, and that's impressive given that the book is only 142 pages. I'm glad I spent the time to read it."